Last week I asked: Where can you “…hear the seawinds blowing”? 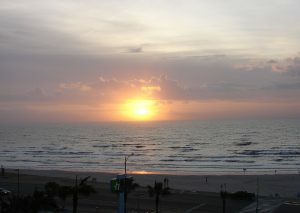 We were in Galveston in January and the sea winds were blowing… and blowing. We were looking forward to walking along the beach but it was just too windy. Unfortunately we were there during the Arctic Vortex which put the south in a deep freeze. We stayed at the Holiday Inn Resort where the swimming pool was heated and while some kids went in and seemed to disregard the weather, it was just too chilly and windy for me. Galveston is a cruise port so I looked at the Carnival Cruise and Royal Caribbean websites. There didn’t seem to be any accommodations available on such short notice so I, not expecting any results, contacted a local agency – Cruise Cats located right in Galveston. The owner/agent contacted me immediately with two reasonable options. 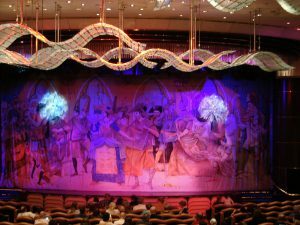 We chose the Royal Caribbean cruise to Cozumel with a window room in the middle of the Vision of the Seas’ Western Caribbean cruise. When I checked Royal Caribbean’s website there was nothing available except a junior suite at great expense. The Cruise Cats’ price was extremely reasonable and included all taxes, fees and gratuities. 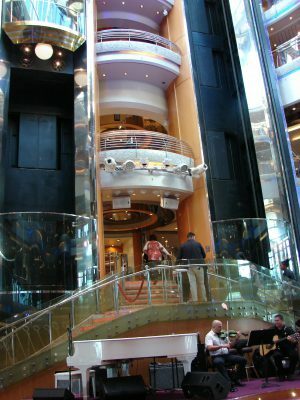 John and I have been on several small ships, maximum capacity 40 passengers, but had never been on a big ship cruise. After I made our cruise reservation I got a surprise call from Nanette, the Cruise Cats owner/agent. She offered to give me a tour of Galveston’s historic district. She was an excellent tour guide. 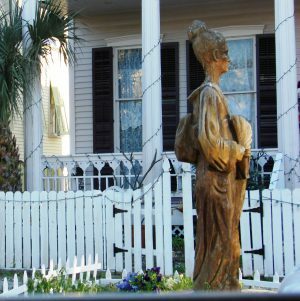 Not only did I see all the important places in the Historic District she shared a lot of local history. One of the things she pointed out were the tree sculptures. Many trees were cut down after Hurricane Ike. The stumps, still rooted in the ground, have been fashioned into statues. 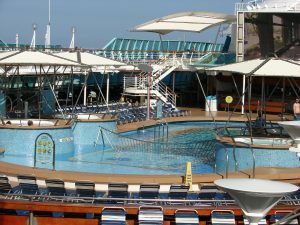 I wasn’t sure John and I would like a big cruise and Vision of the Seas is one of the smaller ship with only 2,435 passengers. I was in for many surprises. First of all, I thought boarding the ship would be easier than boarding an airplane. The Holiday Inn Resort supplied free hotel/ship transfer but then there was a long line to go through security. Then there was another long line to get checked into the ship followed by a long walk to actually get on the ship. 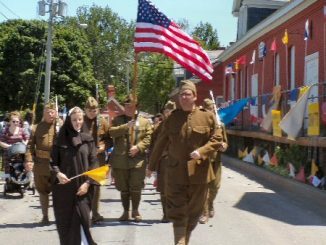 When all 2,000 plus of us were on board, we all had to report to our muster stations. By that time I decided flying was easier. We are TSA Precheck so we don’t stand in line for airport security, airports have trolleys and people movers so walks are not too long, boarding is systematic, and the security is done while everyone is seated on the plane. When the ship left port most of the people seemed to disappear – where did they go? There was always plenty of lounge chairs and getaway places that were uncrowded. I started to enjoy myself. 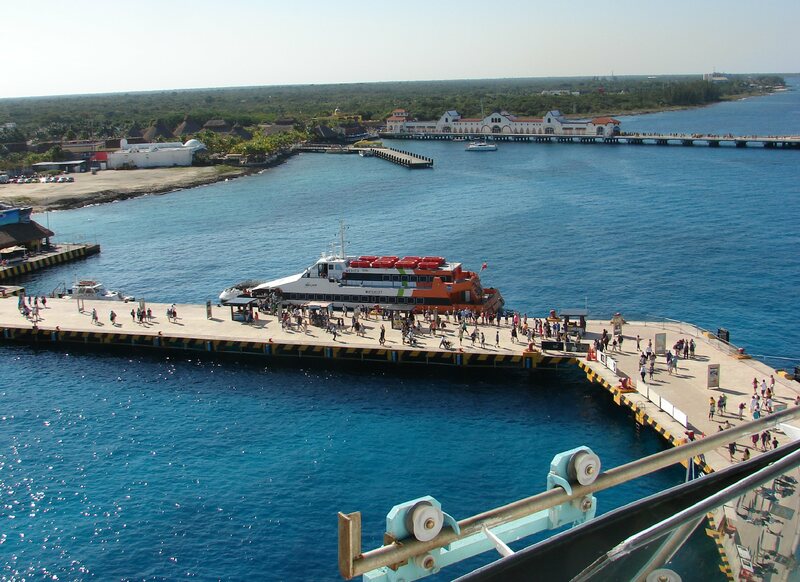 The meals were excellent, the evening shows very nice, and when many of the passengers disembarked to visit Cozumel (we had been there) we stayed on board and I had the whole swimming pool to myself. We really enjoyed the cruise… and the warm weather. Travel Trivia Tease™: What book “helped lay the groundwork for the Civil War”? Whenever I’m in a National Park (I’ve been to 28) I have a rule that each day I must get at least 2 miles away from my car. Doing so gets me 1.9 miles away from the tourists, gets me to even better views than the roadside stops, gets me to see way more undisturbed animals. One time, I got 13.1 miles away from my car and came upon an alpine lake with a glacier emptying into it and got to see the glacier calve (Berg Lake trail; Mt. Robson, BC). Total distance that day: 26.2.